It’s budget-building time and we’re probably all thinking the same thing. How can I get even more out of my team in 2018? Have you ever wondered just how hard you could push a team without stressing them to the breaking point? Provide certainty and clarity. Run a good business. Be well organized. Be fair. Listen intently. Communicate often and effectively. Show support and gratitude. Give A LOT more positive strokes than negative. Exhibit self-confidence and competence. Lead from the front and get after it. Keep your promises. Follow through and deliver. Always. While some of these may seem like common sense, employee engagement research by Gallup demonstrates they’re not common practice. So, how do you make sure you’re exhibiting enough of these behaviors? Like anything else in business, your leadership behaviors must be measured if you want to manage them. With the Flippen ProfileTM, our proprietary instrument, we can reliably measure 13 behaviors that correlate to high-performing teams. #3: Showing support and gratitude can be measured. We’ve found that the optimal level for Nurturing is 5.5 to 7.5 on our 10-point scale. If your Nurturing behavior is suboptimal, your team’s morale will drop. If it’s too high, your team can go soft on you and underperform. #4: Exhibiting self-confidence can be measured. We’ve found that the optimal level for Self-Confidence is 7.5 to 9.25 on our 10-point scale. If your Self-Confidence is suboptimal, your team’s confidence in you and your mission will wane. If it’s too high, you’ll miss or deflect important input from the rest of your team. Case Study: A North American sales director in a client firm was underperforming. Their revenue had stalled at $1.7 billion and was beginning to contract. Our Flippen Profile data showed that though his Nurturing behaviors were within the recommended range, his Criticality behaviors were below target. He had great relationships with his customers and took care of his account managers, but he wasn’t leveraging the relational strength he had built. He wasn’t addressing some team members who were underperforming, and he overly-softened any feedback he gave. After coaching up his Criticality behaviors, the performance of his entire team improved. Within a year, they had grown revenue by $200M to $1.9 billion. Many leaders don’t want to risk relationships to be more demanding. But people want to be developed and grown, not just applauded. When effective leaders expect more from us, we’ll usually give them more. So what are you doing to consistently exhibit the kind of leadership behaviors that allow you to push your team hard without stressing them out? 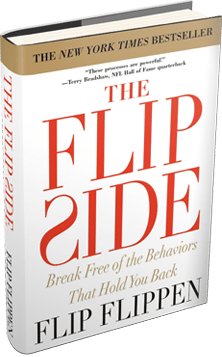 With the Flippen Profile, we can reliably measure the prominence of 13 behaviors that correlate to high-performing teams and help you and your team build a personalized, actionable plan to achieve your business goals.